Today I worked on the One Little Word prompt for February. This month's activity involved making a vision board for our word. 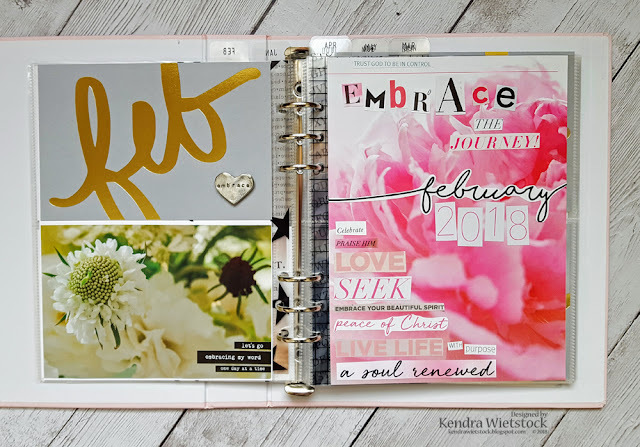 Once again this year, I decided to put the page right in my album rather than make a larger canvas for my wall. I'm trying to live my word more this year, but document it a bit less then last year. I found a new-to-me magazine at the store a few weeks ago and the gorgeous pink flowers on the cover really spoke to me so I flipped through it. It is called Life:Beautiful and it is a really nice publication ~ and at $5.99, it didn't break the bank either. 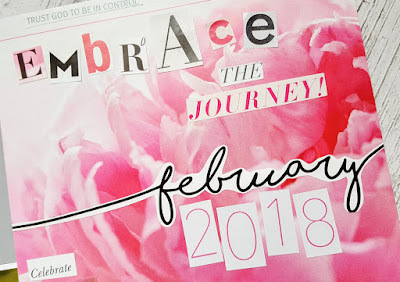 I also used a few phrases from an Ulta store advertisement as well as the February card & phrase stickers from the Ali Edwards One Little Word kit. Enjoy You Day & Embrace the Journey!